OTTAWA, IL. 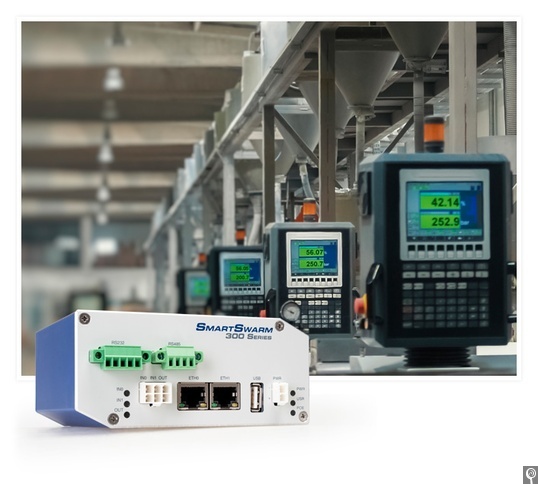 B+B SmartWorx has released the SmartSwarm351, a modbus eavesdropper capable of recognizing and extracting data from Modbus SCADA systems and translating it for use by IT systems in near-real time without interrupting a Modbus master or SCADA network communication. The SmartSwarm 351 connects to enterprise IT applications via local Ethernet connection or internal cellular modem, providing redundancy and deployment flexibility for Industrial Internet of Things (IIoT) applications. The SmartSwarm 351 Modbus Eavesdropper discovers and maps SCADA networks, analyzes message exchanges between master and slave devices, and delivers the information to IT systems. The device also exacts intelligence on raw aggregated data through filtering mechanisms, and configures message packets based on MQTT topics and JSON formatting for ingestion by upstream IT applications. Inbound wireless area network (WAN) connections are protected by an internal firewall, while OpenVPN tunneling is also supported. The SmartSwarm 351 is also the first product to equip the SmartSwarm OSP software framework, a gateway application development tool based on a microservices architecture that supports programming in C++, Java, and Python. For more information on the SmartSwarm 351 and related gateway products, visit advantech-bb.com/smartswarm.